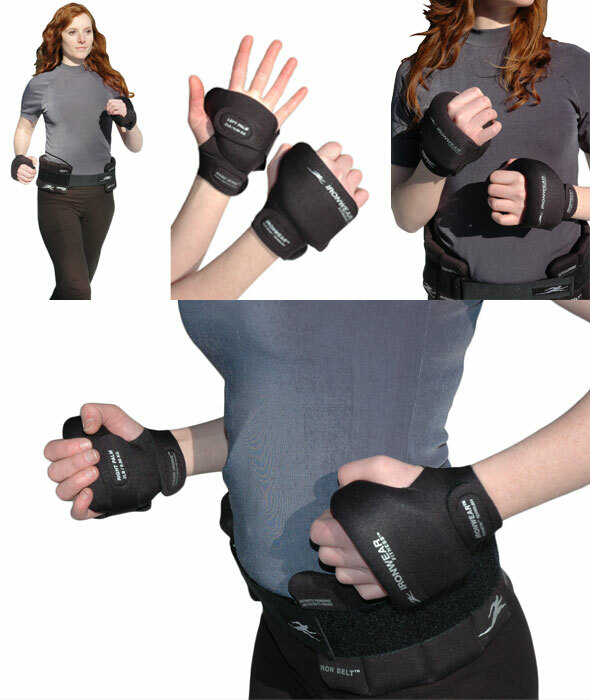 Hand Irons™ are the acclaimed best and safest aerobic hand weights and are used by tens of thousands world wide for running, aerobics, boxing training, karate, and kickboxing. No other hand weights measure up to IRONWEAR ™’s patented Hand Irons™. Hand Irons™ besides increasing arm strength and speed, cause the heart to pump harder to more muscle groups with amazing results. Hand Irons™ can help to improve cardiovascular condition, increase strength, and speed weight loss. Hand Irons™ have a single piece of patented Flex-metal™ which has been sculpted to fit the curves of the hand. The soft rubber weight wraps around from front to the back of the hand to create the only truly balanced hand weight in existence. Hand Irons™ are secured with two wrist adjustment straps and palm adjustment strap. Hand Irons™'s unique patented design provides a tailored fit on any size hand, and leaves the fingers free -no holding required. Hand Irons™ are available in 1, 2, and 3 pounds per hand as well as 3-7 pound adjustable per hand. Hand Irons™ Champion Series weights are covered with an abrasion resistant padded black nylon mesh for maximum durability and sweat wicking.